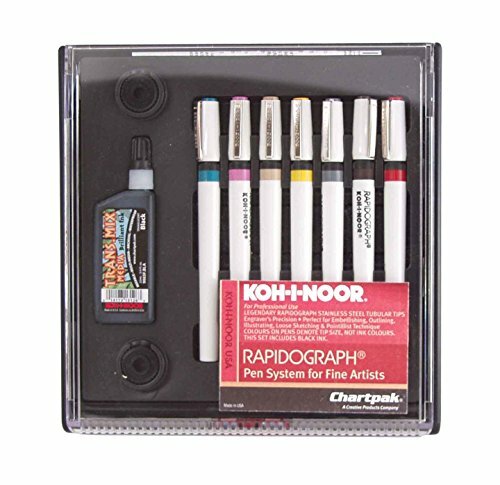 Koh-I-Noor Rapidograph Pen and Ink Set with 7 Assorted Pen Nibs and .75 oz. Bottle of Ultradraw Black Ink features a pen that handles like a pencil, moving in all directions without snagging or digging into the drawing surface. This versatile technical pen is capable of achieving an engraver's perfection, loose sketching style or a finely detailed pointillist technique. Color-coded nibs sizes included: .25mm, .30mm, .35mm, .50mm, .60mm, .80mm and 1.20mm. The included bottle of Koh-I-Noor Ultradraw Black Ink is a versatile, waterproof drawing ink with slow drying for long open pen time. Made in USA. Koh-I-Noor - bringing you the best in professional grade drawing and design.